What do you need to do to be Alerted for bad weather? Do you just keep an umbrella handy or do you really check the news and weather each morning. This is not enough to keep you ready for a storm. Case in point, as I mentioned several times before, businesses and residents of Hatboro, PA were caught off guard last year when a dangerous flood occurred during Tropical Storm Irene. 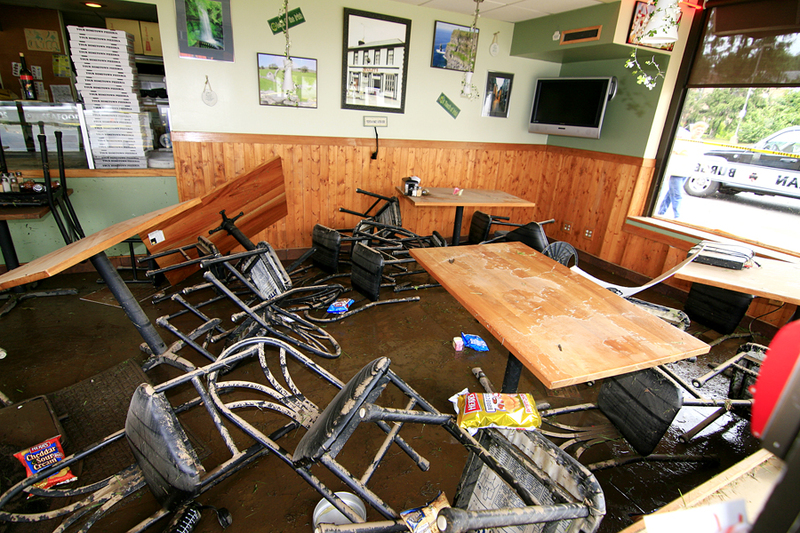 Several businesses had severe damage, and the owners obviously were caught unprepared. Clear warnings of flooding were not known or there was a failure of communication. I took the picture below and it serves me as a reminder that on most days, our streets are calm and from one day to the next, you never know what can happen. BE PREPARED, purchase a NOAA Weather Alert Radio! Here is a factsheet from NOAA explaining how the NOAA S.A.M.E alert system works. There are different types of weather radios, the two below are portables which I own one of each. There are desktop models which have slightly better antennas, which help with getting a stronger signal. There are two local frequencies 162.475 and 162.425 for the Philadelphia area. More tornadoes are being reported and I was just thinking of yesterday being the last day of the National Severe Weather Awareness Week. What better way to be prepared is to build a shelter in your home for you and your family to be secure when a last minute warning is heard and you have just 12 minutes to run for shelter. I have stated a few times before about the importance of having a Weather Alert radio handy if you live in a area of the country that has storms that cause damage on a regular basis. Because of recent flooding seen in our area last year, it looks like no area is safe from storms. An article in today's news mentioned about how more families are building their own tornado shelters. Several parts of the US has seen terrible storms in just the last two months, people react to the news of tornadoes causing destruction to entire communities and people want to be prepared to protect their families.